Turn devastation into imagination: Help us give kids in this tornado-struck town a place to play | KaBOOM! Four months ago, the kids at Phil Campbell Elementary School in northern Alabama had their lives turned upside down—literally. It was on a Wednesday, at 10:45 a.m., that the first storm warnings sounded. The school was quickly evacuated before the mid-afternoon tornadoes hit, but one of its teachers and two of its students would never return. They were three of the 28 people who died in this tight-knit, rural community of 1,000. The tornadoes also took away the school’s playground, which was the only playground in town. After such a tragedy, a playground was exactly what these children needed to heal and recover. Like most folks in Phil Campbell, lifelong resident Kim Sherrill grew up climbing on monkey bars, sliding, swinging and creating imaginary worlds with her friends. Kim understands the healing power of play, and she is determined to do whatever she can to replace that playground. That’s why she reached out to us. Kim says, "They need a place to run and play and be kids again, away from the rubble and pain. Some of these children lost family members—one even lost his leg. We need a playground that is safe and fun; for a child, play is therapeutic and necessary." 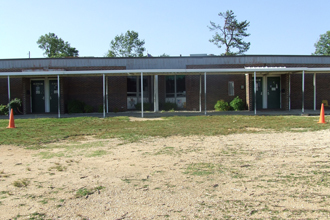 Help us fill the empty field at Phil Campbell Elementary School with playing children by chipping in for Imagination Playground™ blocks. We hope to give the kids in Phil Campbell an Imagination Playground™TM, a revolutionary new play system that encourages unstructured, creative play. 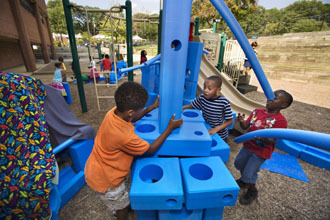 Engaging a child’s body and mind simultaneously, Imagination Playground™ consists of large blue foam blocks, similar to life-size tinker toys. These blocks let children create fairy houses, rocket ships, castles, or anything else that they imagine. Join us in giving the kids in Phil Campbell not just a place to play, but an outlet to heal and to work through their tangled emotions in a safe and comforting environment. We can’t rebuild roofs, restore livelihoods or bring back lost loved ones, but we can bring play back to the children of Phil Campbell, Alabama. Let’s get started! Make your contribution today.